This article has all the information you need to know about gluten free flour blends. From simple, easy-to-use step by step instructions for how to build your own all purpose gluten free flour blend from scratch for baking at home, to copycat versions of popular ready made blends. It’s all here! Can I just use gluten free flour instead of “regular” flour in conventional recipes? The answer is no! Gluten free baking requires gluten free recipes (See 8. The Myth of a Cup-For-Cup Gluten-Free Flour Blend below). Is gluten free flour better for you than regular flour? No! Not unless you have to avoid gluten for other health reasons. Gluten free flour isn’t naturally better for you than wheat flour. Can you buy gluten free flour? Yes, you can! I recommend either Better Batter all purpose gluten free flour or Cup4Cup gluten free flour. (See 1. Don’t Want To Make Your Own Flour Blend? below). What types of gluten free flour are there? Well, I’m glad you asked. That’s what we’re talking about. Read on! Rice is one of the most basic staples in the gluten free diet (yes! rice is gluten free). All of my all purpose gluten free flour blends are rice flour-based blends. It is incredibly important to use a very finely-milled rice flour, or your baked goods will be gritty and the flours will not blend into the other ingredients properly. Typically, I recommend purchasing Authentic Foods superfine rice flours. Recently, I have discovered that it is possible to mill finely ground rice flour at home with some special equipment. Please see the full discussion here on the blog, including price comparisons. You decide what’s right for your family and budget! They’re easy to make. All you need is a simple digital food scale and the simplest calculator you can find. The recipes are expressed in percentages, and you cannot make these blends accurately with volume (cups, tablespoons, teaspoons) measurements, as measuring by volume is incredibly imprecise and each flour has a different weight/volume. NOTE: There are affiliate links on this page. If you click one of the links and purchase products, I earn a very small commission on your purchase, at no extra cost to you. Thank you for making this blog possible! There are 10 sections in this article on gluten free flour blends. Click on any of the links below to take you directly to that section, or scroll through them all at your leisure. Let’s get started! 1. Don’t Want To Make Your Own Flour Blend? 2. What If I Only Want To Use One Blend? 3. How Do I Use the Infographics Below? 1. Don’t Want To Build Your Own Blend? Other blends: I’m afraid that I don’t care for Jules Gluten Free (it’s made with a very, very high percentage of Expandex modified tapioca starch, so it’s very starchy and also rather gummy), Tom Sawyer blend (too starchy), Namaste (unbalanced), Krusteaz (unbalanced), Bob’s Red Mill (their bean flour blend is simply unpleasant; their 1:1 rice flour blend is unbalanced and very grainy), Pillsbury (grainy) Betty Crocker Rice Flour Blend (grainy), or Trader Joe’s Blend (I reviewed it here). If you use any of these blends, especially Bob’s Red Mill or Namaste, your recipe simply will NOT turn out. Want to build a blend but don’t want to do any math? Scroll down for a downloadable Excel file with a calculator for each blend! If you add up all of the numbers, it will equal 140 grams (go ahead and check!). So make as much or as little as you like. I generally make 10 cups at a time of my favorite blend (which at this point is the “Better Than Cup4Cup Flour Blend”). **ETA: I added the High Quality Gluten Free Bread Flour Blend from GFOAS Bakes Bread to the Excel calculator worksheet! This mock Better Batter flour blend is a dairy free, gluten free blend made of equal amounts superfine white rice flour and brown rice flour (30% each), equal parts tapioca starch and potato starch (15% each), less potato flour (5%), 3% xanthan gum, and finally 2% pure powdered pectin. It is super important to use superfine rice flours, as otherwise your blend will be gritty. The rice flours, potato flour, tapioca starch and powdered pectin simply cannot be substituted for anything else. The potato starch can be replaced with corn starch or arrowroot, and the xanthan gum with an equal amount of guar gum. What is the blend good for? Better Batter is what I use when I need a bit more structure (like cut out sugar cookies since it’s a very simple doughs and I don’t want it to fall apart at all) and/or a bit more chew (like gingerbread cake and morning glory muffins). Mock Better Batter is also good for recipes like the devil’s food cake cupcakes since I want them to rise evenly, and a lower starch blend is very helpful in that endeavor. 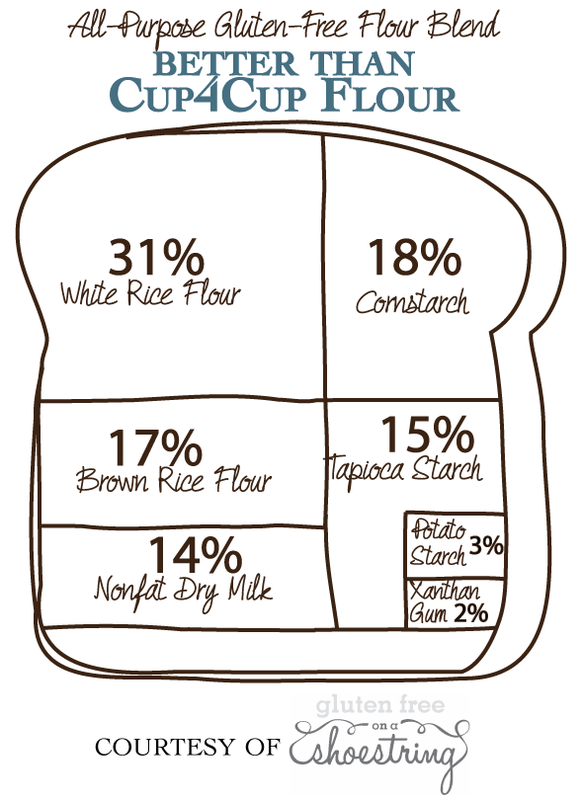 Higher starch blends don’t usually hold together as well or rise as evenly. Finally, with sturdy cookie recipes like the soft batch chocolate chip cookies, the butter in the blends tenderizes the heavier Better Batter flour perfectly. This is my go-to blend for standard drop cookies. One more important thing about (Mock) Better Batter: It is the flour that I use to build my High Quality Gluten Free Bread Flour for alllll the amazing breads in Gluten Free on a Shoestring Bakes Bread. I’ll be honest: when I make that bread flour, I use Better Batter itself. I don’t build a mock Better Batter for that. It’s actually more economical to buy Better Batter than to blend it yourself, and way easier. It cuts the bread flour down to 3 components: Better Batter, whey protein isolate, and Expandex. This blend behaves just like Cup4Cup in recipes. Cup4Cup has much more white rice flour than brown rice flour, it’s quite high in starch and it contains nonfat dry milk. 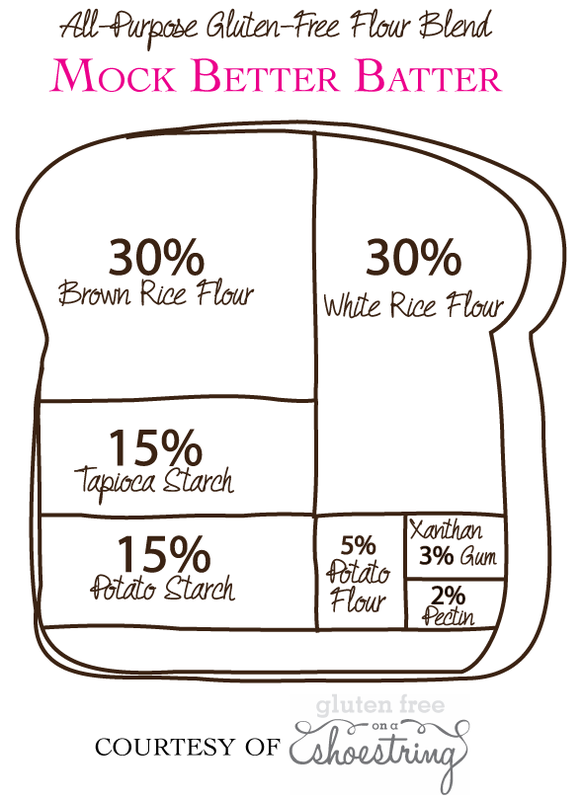 The two ingredients present in the largest quantities are superfine white rice flour (31%) and cornstarch (25%). It has almost equal amounts of tapioca starch (15%) and superfine brown rice flour (14%), with 10% nonfat dry milk, a wee bit of potato starch (3%) and finally, and 2% xanthan gum (slightly less than Better Batter has). The rice flours, tapioca starch and nonfat dry milk simply cannot be substituted for anything else in this blend. Although I haven’t tried this, the cornstarch and/or potato starch may be able to be replaced with arrowroot, and the xanthan gum with an equal amount of guar gum. What’s the blend good for? Cup4Cup is really a pastry flour. High in starch, lower in protein, it’s just a dream for pastry. Light and airy, it does just what pastry flour is meant to do: surround the cold butter in a recipe smoothly, and then puff effortlessly when the cold butter hits the heat of the oven and gives off steam. And Cup4Cup does have enough protein and structure to trap the steam given off in the oven, which is important. If you just use a high-starch blend that doesn’t have the other attributes of Cup4Cup (notably, dry milk powder and xanthan gum), it won’t trap steam and you won’t get the flaky goodness of the beautiful biscuits, scones, pie crusts and puff pastry. As the name implies, I think it’s even better than Cup4Cup, as it corrects what I believe to be the imbalances in that blend. 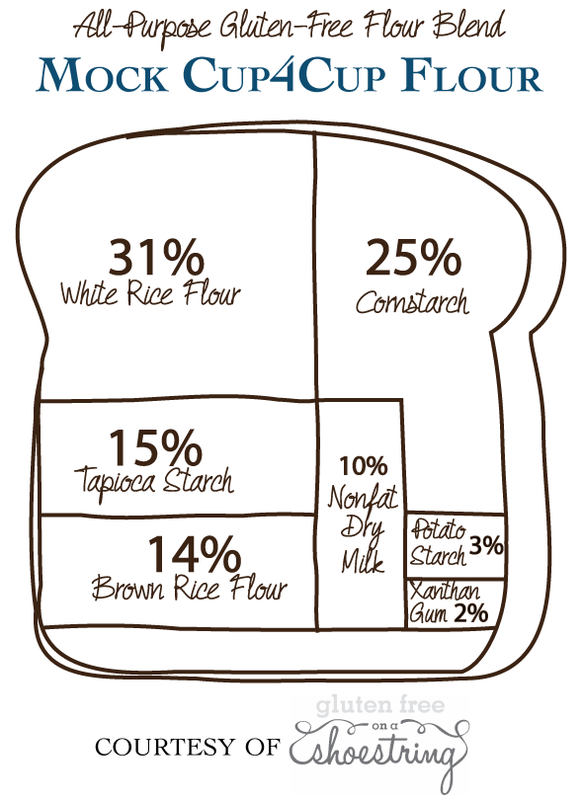 It contains almost 1/3 superfine white rice flour, similar amounts of cornstarch (18%), superfine brown rice flour (17%), tapioca starch (15%) and nonfat dry milk (14%). A small amount of potato starch (3%) and even less xanthan gum (2%) round out the blend. Like the mock Cup4Cup blend, the rice flours, tapioca starch and nonfat dry milk simply cannot be substituted for anything else in this blend. Although I haven’t tried this, the cornstarch and/or potato starch may be able to be replaced with arrowroot, and the xanthan gum with an equal amount of guar gum. This is generally my favorite all purpose gluten free blend. It’s just light enough without being too starchy, never tough, and it’s particularly good for doughs that you have to roll out since it rolls out really smooth (like pierogi). It’s not my favorite for pastry, since my mock Cup4Cup is just the perfect pastry flour—low in protein, high in starch. Better Than Cup4Cup is great for recipes that are a little bit more delicate, but not fragile (like churros), and recipes that I want to lighten up a little (like chocolate pound cake). I also really like it for lighter cookies, like snickerdoodles, chewy sugar cookies and drop sugar cookies. It’s just a great all-around blend. Love it! 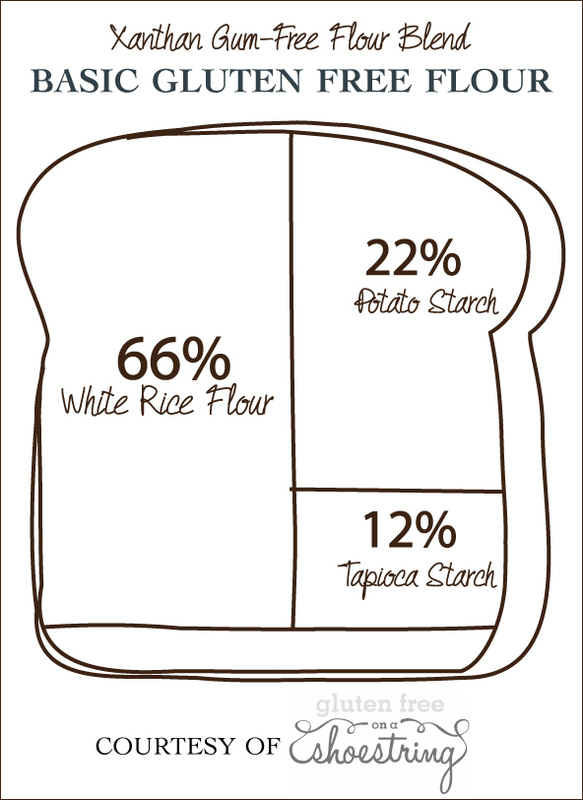 This blend has only 3 simple ingredients: two-thirds superfine white rice flour (66%), nearly one-quarter potato starch (22%), and the remaining 12% is tapioca starch. The white rice flour cannot be substituted with brown rice flour, or anything else. It is essential to the blend. The tapioca starch cannot be substituted either, but the potato starch can likely be substituted with corn starch or even arrowroot. I like to use this blend in delicate things like and gluten free pancakes. This gum free gluten free blend serves two really, really important purposes: (1) allows us to make the lightest most delicate recipes like crêpes, pancakes, puddings (without resorting to using cornstarch as a thickener, since that ‘leaks’ liquid as it cools) and super crispy cookies), and (2) equally important, it allows us to really control the amount of xanthan gum in a more delicate cake recipe, like sponge cake or champagne cake. You do need some xanthan gum even in cakes, though. They will rise and hold together reasonably well without xanthan gum, but they will crumble too easily (do we really want to perpetuate the myth that gluten free baked goods are crumbly?!) and they will get stale really fast. One more thing a gum-free blend is necessary for that isn’t pictured here is gravies and sauces. You cannot make a good roux with xanthan gum, so don’t even try. Trust me, you want to stock these 3 component flours to have this blend for when you need it. It isn’t needed all the time, but it’s important to a complete gluten free pantry. I usually keep a few cups of it already blended, but since it’s so simple that really isn’t strictly necessary. Gluten-free baking calls for gluten-free recipes. Plain and simple. There is no such thing as a cup-for-cup gluten-free flour blend that mimics conventional flour enough to be used in all of your conventional recipes. Even though some commercial blends may call themselves a cup-for-cup replacement for all-purpose wheat flour, a cup for cup replacement for all purpose flour is a myth. I have, by now, tested many gluten-free flour blends. But I have had my eyes wide open the whole time. I took note of each flour blend’s cup for cup claim – and then ignored it. That’s why I have been using my gluten-free recipes for the each test, rather than using conventional recipes. You see, they’re different. Gluten-free recipes and conventional recipes are different from one another. Gluten-free food should taste so great it makes your toes curl. It shouldn’t be “good, for gluten-free.” And I will not rest until not a single soul ever again tells us to “c’mon,” since “no gluten-free pizza is going to be any good.” The heck with that! But that doesn’t mean that our path to excellent is exactly the same. We have to get there another way. We have to make our own way. Gluten-free baking is still relatively new. No one can claim to know everything about it. Most gluten-free flour companies that make an all-purpose gluten-free flour tell you that all you have to do is just replace an equal amount of their flour in your favorite recipes, and that’s that. Some of those companies sell amazing gluten-free flour blends, and I’m a fan of from way back. But that claim? It’s not even interesting to me. I blow right past it. We took out gluten! When we did that, we removed the essential protein in wheat-based flours that gives baked goods their texture and mouth feel. No matter what we replace it with, it’s just not going to behave exactly the same in the process of baking. Same result, different route. What I’m expecting is an all purpose gluten free flour. One that performs well for all purposes. But that doesn’t mean it performs the same as gluten-containing flour. And it doesn’t have to. My most basic advice? Go into gluten free baking with your eyes wide open. It takes experience to know how to modify a conventional recipe to make it a gluten free one. Start with good gluten-free recipes, and move on from there. Don’t expect magic from an all purpose gluten free flour blend. Expect great food, made just a bit differently. But don’t worry. I’ll be there with you, every single step of the way. If you cannot use cornstarch, try using arrowroot as a substitute.